Hi my name is Lauren Lazar, I am 21 years old and reside in Highland Park. I have 7 years of experience with children/infants, ages ranging from 2 months to 16 years old. I have worked with children in day cares, babysitting/nannying ,camps and assistant teaching. I have about 3 years of experience being a nanny. 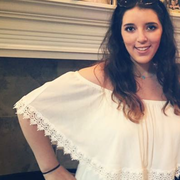 I will nanny for a few weeks for the kids I babysit regularlyI when needed.I am majoring in early childhood development at the College of Lake County, and would love to pursue it with more experience. I have my own car,I am alcohol/ drug free.CPR trained and certified in food sanitization. I also have 3 dogs, so I am very pet friendly and am happy to help out with animals as well.I am very loving, patient and outgoing and love having activities that children will find entertaining/educational. Lauren showed up early, and was friendly and courteous. She did a great job of asking all the right questions and familiarizing herself with the children and the house. We have a 2 year old who no-matter-what, throws a fit everytime we leave, and she didn't balk at that at all and handled it quite professionally. Even sent us a picture of the 5-month old after she had gotten him asleep, very cute and reassuring to see! Listen, we were in a bind, and needed someone quick for a short period of time and she went above and beyond what we needed, she did a great job and we'd definitely recommend her to anyone else who needs a little time out with young ones.